A zeolite is a crystalline, porous aluminosilicate commonly used in catalytic operations. The zeolitic channels, or pores, are microscopic. 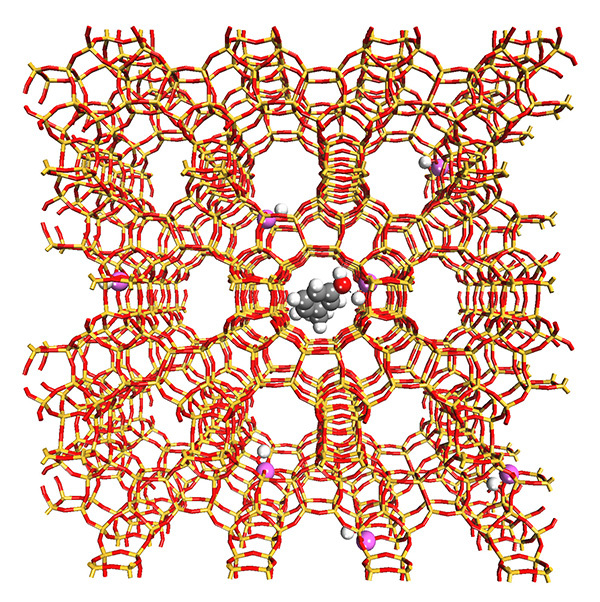 This model represents a low aluminum H-BEA zeolite pore system with a phenolic molecule inside, such as a lignin-derived phenolic monomer, for biomass-derived renewable fuel production. (Image created by Amity Andersen, PNNL.) Enlarge Image. The May 2015 issue of the Institute for Integrated Catalysis' Transformations focuses on zeolites- crystalline structures that play a key part in catalysis. In the lead story, which appeared in EMSL's The Molecular Bond, catalysis scientists discuss how capabilities at the Department of Energy national user facility have furthered zeolite research. The value of collaborating and networking at the nation's largest chemistry scientific meeting is featured, when PNNL catalysis scientists went to the American Chemical Society spring meeting. Transformations also contains the Institute for Integrated Catalysis's (IIC's) latest video, "Zeolites: Exploring Molecular Channels." 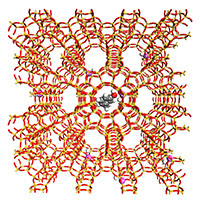 IIC scientists Ilke Arslan and Mirek Derewinski illustrate and explain their work on zeolites.